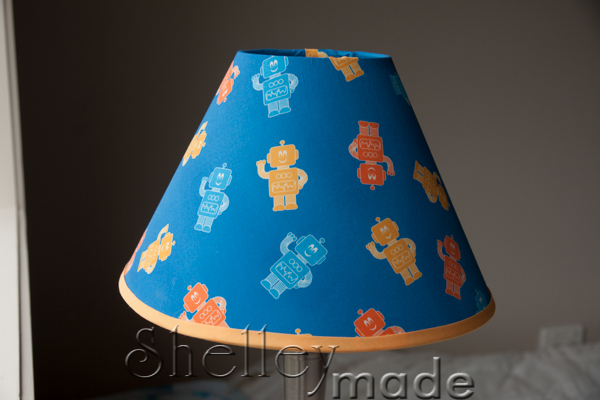 Following on from my last post - about the wall canvases, I moved on to the next task...a new lampshade cover! Not quite right for a wee boy is it?! 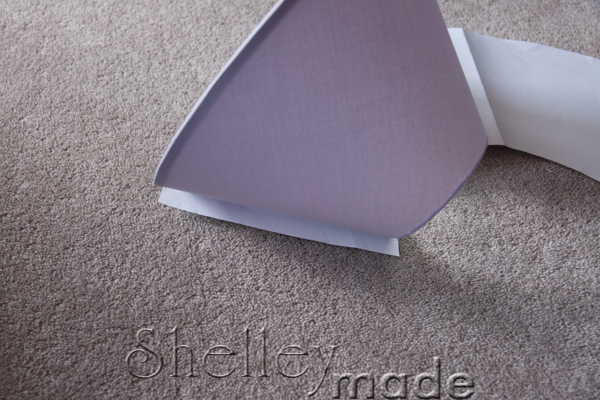 Card or a dropcloth to protect your surface while spraying! It was fairly straight forward to do. I needed to first make a paper template, in order to cut the fabric out right. 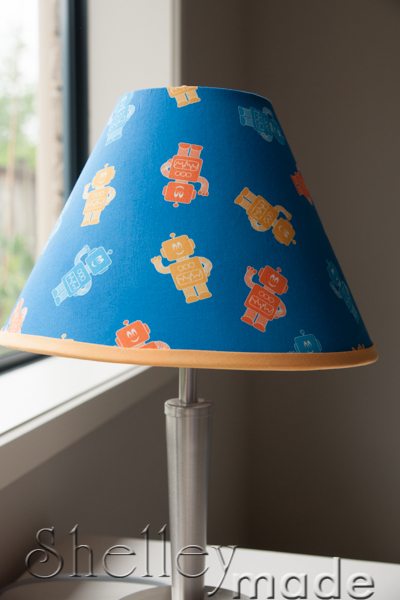 To do this, I found the seam on my old lampshade cover. I placed that on one edge of my paper, and rolled it around, drawing along the top and bottom of the cover as I rolled. I stopped once I got to the seam again, having drawn the complete circumference. I then added an inch to one end as a fold over to get a neat finished seam. 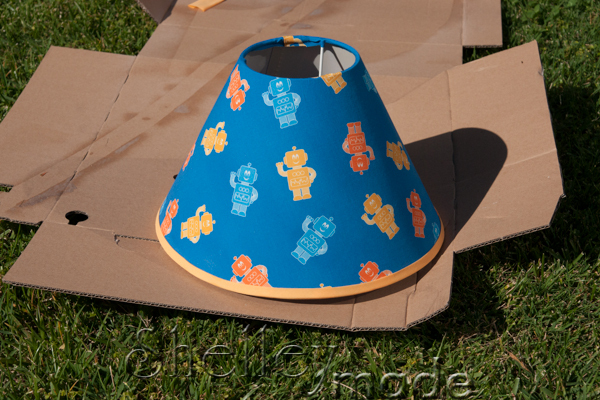 This is what my template looked like after I cut it out - with the lampshade placed so you can see how I rolled it. 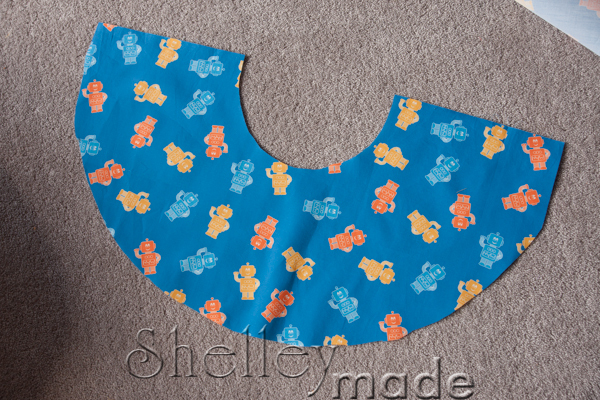 Next, use your template to cut out your fabric. If you are using bias binding both top and bottom (I didn't - I only used it for the bottom), then cut the template out exactly as is. 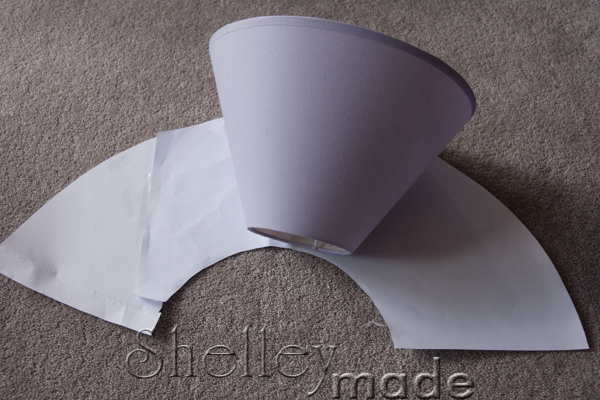 If you do as I did - and only edge the bottom with binding - then cut the top edge (smaller semi-circle) about an inch wider so you can wrap the edge over the top of the lampshade neatly. Go somewhere with some ventilation for the next part. I laid an old cardboard box down on the lawn. I placed my fabric wrong side up, and gave it a good spray with the adhesive. I couldn't get any photos of doing this, as I had to work quickly in the heat of the day before the glue dried! 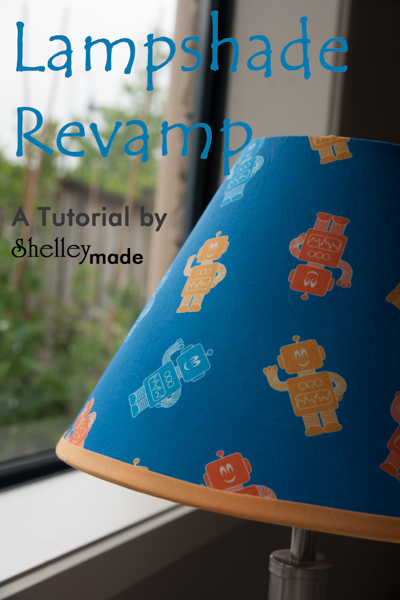 It's as easy as wrapping the fabric around the lamp as smoothly as you can, matching the bottom of the shade to the bottom of your fabric. When you get to the side end, overlap the starting edge a little, then fold the rest of the fabric under to neaten the raw edges, add a little glue, and stick it down. I used spray adhesive for this, as I was worried about bumps and lumps on the shade if I brushed glue on... The spray gave a lovely even light coating, and has stuck well. 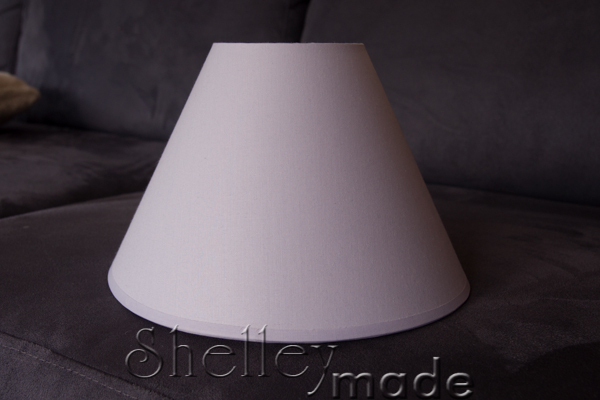 I folded the remaining fabric over the top, and down into the inside of the lampshade. I decided it was busy enough without adding binding to the top, but I wanted it on the bottom. To do this, I cut an approximate length of bias binding, sprayed the back of it with the glue, and ran it evenly around the bottom - up about half an inch from the edge. I started at the same seam line as the rest of the shade, and ended it by tucking a little under again for a nice edge. Once I got all the way around, I then folded the overhanging binding into the inside of the lampshade, completely covering the bottom cut fabric edge. Really quick, really simple, and really easy. And it matches the bedroom! Next...the Roman Blind for the window.